Rockland County, New York is taking a drastic step to curtail its ongoing outbreak of measles. 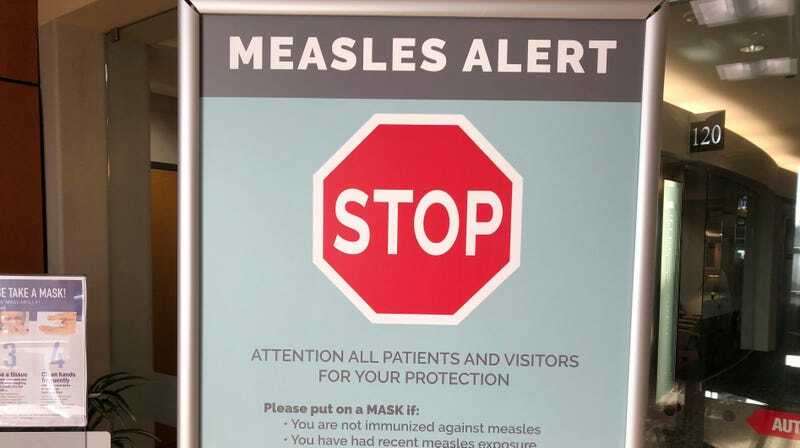 On Tuesday, Rockland County executive Ed Day announced a ban on minors unvaccinated for measles from entering public spaces like restaurants for a month. Though immunization statuses will not be actively tracked by police, the parents of children caught flouting the order face the risk of possible jail time and/or a hefty fine. News of the ban, established via a county-wide State of Emergency declaration by Rockland officials, was leaked by media outlets earlier Tuesday morning. At the time, many of its details, including how it would be enforced, were unclear. But at a press conference held this afternoon, Day laid out how it would work. “Effective at the stroke of midnight tonight, March 27, anyone who is under 18 years of age and unvaccinated for measles will be barred from public spaces until the declaration expires in 30 days or until they receive their first shot of [the measles, mumps, rubella, or MMR, vaccine],” said Day. Children who would be exempt from taking the vaccine for medical reasons will also be exempt from the ban. According to Day, it’s the first time a local government has issued this wide-sweeping of a ban to deal with measles or other vaccine-preventable diseases like chickenpox. Previously, the New York City suburb temporarily barred unvaccinated minors from attending school. This ban was challenged in court by parents this March, but their request was denied by the presiding judge. Last week, an unvaccinated Kentucky teen’s family sued their state’s health department over their similar chickenpox ban. Yet the gravity of Rockland’s outbreak, Day said, merited the upgraded ban. According to health officials, there have been 153 confirmed cases of measles in the area since last September (and likely more not yet diagnosed). And despite efforts to contain the disease, including free vaccination clinics, cases have continued to trickle in amid pockets of anti-vaccination resistance. Signs announcing the ban will be placed in public spaces starting this afternoon. However, it won’t come with any sort of measles gestapo. The current tally of the outbreak, Day said, is the largest recorded in one specific area since at least 2000, when measles was formally eradicated from the country (eradication meaning that there are no natural, local sources of a disease). Outbreaks since have been entirely sparked by travelers bringing the disease back from countries where measles is still common. In the case of the Rockland outbreak, it’s thought the original carriers caught measles while visiting Israel. According to health officials, more than 80 percent of local cases have occurred among the unvaccinated. These cases have been concentrated among segments of the Orthodox Jewish community. The religion as a whole does not discourage vaccination, and rabbis in the Rockland area have worked with health officials to find and convince people to vaccinate their children. But some ultra-Orthodox rabbis endorse the debunked tenets of the antivaccination movement, contributing to a relatively low vaccination rate. While more than 90 percent of children between the age of 18 to 35 months have received at least one (of two) MMR shots nationwide, only 72 percent of children under 18 have done the same in Rockland County, according to Day. While Day said that the government won’t go out of its way to punish parents who violate the order, the violation will count as a class B misdemeanor, which in New York can merit a sentence of up to six months in prison, in addition to or in place of a $500 fine. The ban will apply to places like restaurants, movie theaters and places of worships, but not outdoor public spaces like parks. Day said that they are also drafting legislation to better proactively protect the public during future outbreaks. Rockland isn’t the only place in New York grappling with measles either; a similar outbreak concentrated among Jewish communities in nearby Brooklyn and Queens has been ongoing since last fall as well, with more than 190 cases documented as of mid-March, according to the New York City Department of Health. Washington state has also been dealing with its own outbreak of measles, prompting a state of emergency declaration by Governor Jay Inslee earlier this January.